"Upgrade," an irresistibly gory science-fiction melodrama, is B-movie schlock done right. The film follows pseudo-everyman mechanic Grey Trace (Logan Marshall-Green) whose body and wife are destroyed by upwardly mobile cyborgs with a God complex (no, really). From this plot synopsis, you might think that writer/director Leigh Whannell has a lot to say about man's relationship with technology. You'd be wrong since Whannell (writer/co-creator of "Insidious" and "Saw") doesn't have the patience to develop any of his film's bigger ideas about how modern technology uses its creators more than we use it. Thankfully, viewers with a hearty stomach and a taste for blood will be delighted to learn that Whannell delivers other things in abundance, like sickening violence, a Dr. Frankenstein-like computer scientist, a bar that's decorated with as many bones (human and animal) as Leatherface's den in "The Texas Chainsaw Massacre 2," and a mystery sub-plot whose clues are all instantly ferreted out by "Stem" (Simon Maiden), a devil-on-your-shoulder version of KITT from "Knight Rider" who lives inside Grey's post-accident head. You'll have a good time with "Upgrade" if you don't take Whannell's half-baked ideas or unabashed blood-lust too seriously. 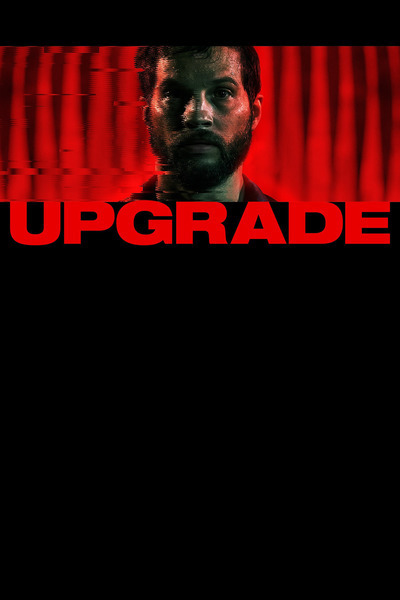 "Upgrade" begins by tacking on a scifi gloss to an otherwise paint-by-numbers revenge story. Grey and his wife Asha (Melanie Vellajo) are ambushed by the above-mentioned cyborgs while their self-driving car delivers them to their seemingly fully computerized home. Grey and Asha's car is hacked and destroyed during an unexpected stopover in the poverty row suburb where Grey grew up (he and Asha don't notice something's up because they're too busy making out in the backseat). But Grey's house is just as plush and stylistically confusing as the pseudo-basic man cave that their car is driving them away from: the subterranean lair of pouty super-scientist Eron (Harrison Gilbertson), whose futuristic man-cave's foundation is built out of concrete, granite, wood and glass, but is also filled with the same softly-hissing automated doors, voice-command-activated appliances, and touch-screen table-tops as Grey and Asha's house. The rich do live differently in "Upgrade," but Grey is tentatively identified as an outsider since he works with his hands and has a manly, face-assimilating beard that reduces his facial expressions to a gaping mouth and bulging Muppet-sized eyes. Grey's superficial man-of-the-people vibe ingratiates him to Eron, a creepy loner genius whose vibe is essentially "the soul of Colin Clive in 'Frankenstein' but in the body of a bad James Dean lookalike." So Eron offers to help Grey after evil cyborgs kill Asha (not a spoiler, it happens early on!) and turn Grey into a quadriplegic: Eron will implant a radical computer chip named Stem inside his Grey's body, thereby helping the crippled mechanic regain control over his body's basic motor functions. Unfortunately for Grey, Eron doesn't immediately describe some of Stem's key features, including his sentience--Stem talks to Grey with a dispassionate robo-voice, like HAL 9000's low-budget under-study, HAL 350--and his ability to commandeer and even boost Grey's control over his body--whenever Grey gives Stem permission to do so. Stem naturally uses these super-human abilities to help Grey find his wife's killers. It's tempting to compare Grey to RoboCop--another amoral killing machine struggling for his mortal soul--but Grey's personality isn't submerged inside his body the way that Peter Weller's hapless ghost in the machine was in Paul Verhoeven's satirical 1987 bloodbath. Grey actively encourages Stem to do whatever he needs to in order to first protect their shared body, and then further his own vengeance-fueled investigation. Any pretensions of humanistic cyber-commentary that Whannell and his film may have are undermined by the scene where Grey commands Stem to use his body to disarm a group of pub-dwelling thugs after they drag Grey into a bullet-case-and-urine-littered bathroom. Grey gives Stem the go-ahead to mercilessly cut up one thug's face off-camera. Grey also tells Stem to stop twice, but he doesn't object too strenuously once Stem's victim gives Grey whatever answers he desires. If you take this scene seriously, you might conclude that Whannell thinks that technology has finally proven what the military could not: torture is good because it's effective! Your suspicion would only be further proven correct by the way that Grey never pauses to reflect on his penchant for remorse-less robo-enhanced murder. But again: "Upgrade" is not that kind of picture, nor does it need to be. Whannell's mashup of a man-vs.-technology narrative with a revenge-fueled whodunit is as fun as it is because its chase scenes involve sadistic, artificially intelligent computers, nanotech bacteria, and Cronenberg-like hand-guns (ie: there are literally guns in some people's hands). Marshall-Green sails across the screen, doing somersaults, karate parries, and even Michael Jackson's 45-degree-angle lean while he cleaves baddies' jaws in two and/or shoots their brains out. And through it all, murder-mystery clues are doled out with reckless abandon while supporting characters--like Grey's mom (Linda Cropper) and the suspicious detective (Betty Gabriel) assigned to his wife's case--come and go without much rhyme or reason. The key to enjoying "Upgrade" is relishing its over-the-top characterizations, plot twists, and cheesiness. "Upgrade" may not be a capital-G Good film, but it can be a very enjoyable one.